If your dog needs it, we carry it! A partial list of our products includes dog food (dry, canned, frozen raw, freeze-dried), toys, collars and leashes, beds, supplements, bowls, training supplies, stain and odour, treats, chews, books, grooming tools, carriers, crates, coats, boots, as well as poop bags. Everything for your cat and then some! A partial list of our products includes cat food (dry, canned, frozen raw, freeze-dried), catposts, toys, litter and litter pans, beds, supplements, stain and odour, treats, dishes, collars, carriers and enough catnip to keep your cat occupied for hours. We have a good selection of small animal products, including food, cages, houses, toys, supplements, treats, bedding, litter and litter pans. We provide everything you will need for your bird, including food (seed and pellets), perches, treats, dishes, cages, supplements and toys, toys and more toys! We have the supplies you need, including food (dry and frozen), aquariums, filters, air pumps, gravel, ornaments, heaters, and water treatment products. If you need supplies for your scaled friend, we can provide food, terrariums, heating and lighting, substrates and ornaments. Tails is pleased to offer a full range of professional grooming services for dogs, cats and even small animals! Our groomer works in a custom designed space that was specifically created for optimal grooming conditions. With a crate free environment and a focus on one pet at a time, we promise to treat your pet right! As the trusted source for pet food and supplies in the East End since 2007, Tails is pleased to offer our local customers the convenience of free delivery! Established in 2007, we are a retail pet store in the East York neighbourhood of Toronto. We have won awards with Blog T.O, Toronto Life, Yelp and Google Reviews. We sell pet food and supplies and offer professional grooming of dogs, cats and even small animals! Come visit us and see what all the fuss is about! Help us do some Spring Cleaning & save up to 50%! We’re trying to make room for some fresh, new & exciting products, so we’re asking you to help us and save money at the same time! We have a huge assortment of items on sale, including dog apparel, toys, crates, collars & leads, beds, and many other items! All red tag items are great deals, and as always, if you are a member of our loyalty program, you can get even greater discounts on any green tag item… This sale is on until the end of April! Doggy teeth cleaning at Tails! 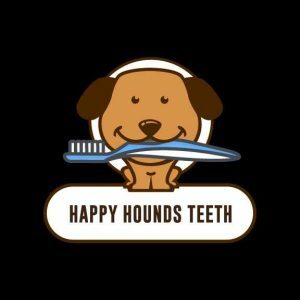 Tails is proud to announce that one Sunday a month, we are hosting Happy Hounds cosmetic teeth cleaning! A one-hour session results in sparkly teeth for your dog with no sedation… only gentle and natural methods are used! Some dogs are so relaxed during the session that they fall asleep! 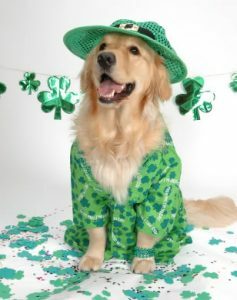 We love St. Patrick’s Day, and so will your pet! Every year, in the week leading up to that magical day, March 17th, we have a fun sale! After you make a purchase in the store, you are invited to randomly draw a poker chip out of a festive hat… and depending on the colour of the chip, you get a discount of up to 30% off your next purchase! No expiry! So bring your lucky charm, and come earn a discount on your pet’s favourite item! What can I do to help my dog lose weight? 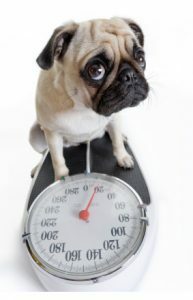 First off, if your dog is severely overweight, you need to check with your vet and see if there are any complications that will alter how we approach losing weight. These guidelines are for an otherwise healthy animal, and will help your dog lose some weight and prevent the ideal dog from gaining. This seems obvious, but the feeding guide on your bag of dog food is designed for an average dog with an average metabolism. In other words, it’s just a starting point. Feed according to the weight your dog SHOULD BE, and cut back a little to accommodate for any treats you give throughout the day. Check periodically your dog’s weight and tweak the amount fed based on your dog’s needs. A healthy dog should only want to eat as it’s energy reserves dictate. It fits nicely into our routine to feed our dogs twice a day, but they don’t need the same amount all the time. My suggestion is to put out a serving, and if it’s not eaten in 10 minutes, put it away for the next meal. Likewise, if your dog is at a good weight and wants more, that’s ok too. Some dogs shift their eating cycle to once a day, and that works for them. As long as their weight is maintained at a good level, there is no need to stress out about the timing or exact amount of food given. Imagine that twice a day you were given a bowl of spaghetti, your favourite, but on this one occasion you just didn’t feel like eating it. Maybe you had a lazy day and just don’t feel like eating right now. So I add some freshly ground parmesan cheese to the spaghetti. Will you eat it now? You’re still not hungry, although the gesture is appreciated. Maybe you take a second look and a sniff, but still, you’re just not hungry. Now I’m upset, and think you MUST eat your dinner! What if I add some meatballs on top? Will you eat it now? No matter what is loaded onto that plate, it doesn’t change whether you are hungry. Same goes for your dog. 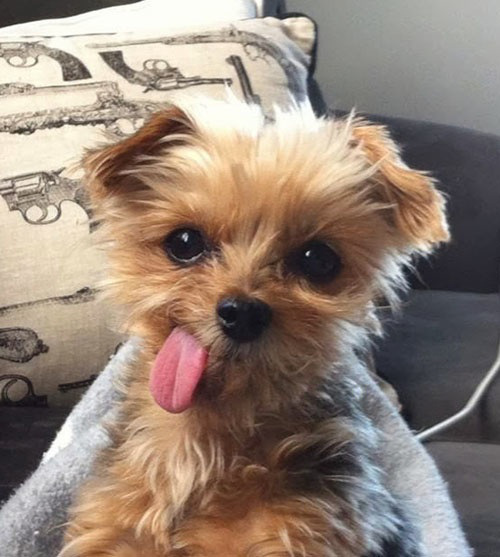 It’s healthy to fast for a day, and don’t forget that dogs are clever. You dress up the food once, and you will get those puppy eyes every time you offer the food with no toppings. Stay firm. You’re in charge. Be wary of foods that emphasize only one of these aspects. If all they talk about is how high the protein level is, then they may not be looking at the whole picture in terms of a nutritional balance. If there are all sorts of pictures of fruits and veggies on the bag, but they are actually listed at the bottom of the ingredient panel in amongst the vitamins and minerals, then that’s just a marketing ploy. Likewise, don’t feed just raw chicken breast and think that’s a complete and balanced diet. Just like us, it’s difficult for a dog to lose or avoid gaining weight if the food is heavy on the carbs. Diets for us have shifted from the “low fat is healthy” mantra, to emphasizing healthy proteins, healthy fats, and lower glycemic carbs. Unfortunately the pet industry hasn’t caught up completely. There are still “lite” or “weight management” formulas out there that are low in protein and carb-heavy. Come by the store, and we’ll help you sort through the differences in formulas and find a perfect diet for your dog! My cat isn’t fat, it’s just fluffy, right? Wrong! In short, a lot of the same risks a person has with regards to their weight, also affects dogs and cats. Being underweight is also not good, and can be a symptom of an underlying problem. 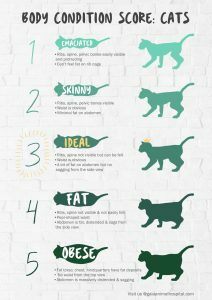 In the quest for your pet being the best it can be, let’s figure out where your dog/cat fits on the obesity scale. Looking from above, you should be able to see a waistline, but no ribs, and you should definitely not be able to see the bumps of the spine! 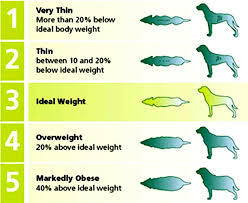 If the waist is equal or bigger than the chest, your dog is overweight. Looking from the side, you should see a bit of a tummy tuck. If the line of the tummy is flat across from the chest or is larger, your dog is overweight. And what about your cat? Is it on the tubby side? Similar to dogs, you should not be able to see ribs, but still a waistline, and that swinging paunch is definitely a sign your cat is obese. 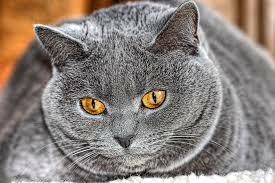 So what should you do if your cat or dog is overweight? Or underweight? Stay tuned! Or come see us at Tails, 1035 Coxwell Ave, East York for a personal (non-judgmental!) consultation. Do you like us? If you want to keep up to speed with news, events and sales, follow us below! Tails © 2019. All Rights Reserved.